There's no need to carry around a decade box and RTD resistance tables, with the CL510A RTD simulator you can calibrate directly in temperature (°C and °F). Choose between a single RTD type model, CL510A-1 (Pt100, 0.00385), or a CL510A-10 for multiple RTD types. The CL510A-10 works with a wide variety of RTD curves including Platinum 100 (alpha = 3850, 3902, 3916, 3926) and 1000 (alpha = 3850, 3750) Ω, Copper 10 and 50 Ω, Nickel 100 and 120 Ω. 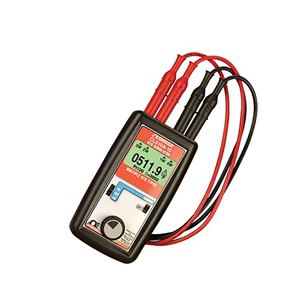 Easily set any value quickly to within 0.1° with the adjustable digital potentiometer "DIAL". Connect directly to RTD inputs of smart transmitters, PLCs, controllers and multichannel recorders and verify their displays. Nota: Comes complete with 4 "AA" alkaline batteries, RTD wire kit with 2 red and 2 black leads with retractable shield banana plugs and spade lugs, and operator’s manual.